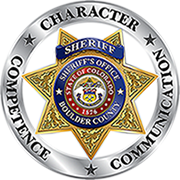 The Boulder Boulder County Jail Courts and Transports Team is responsible for getting inmates to any of the 20 criminal, civil, and traffic courts of the 20th Judicial District, located in Boulder and Longmont, to appear before a District Court Judge, County Court Judge or Magistrate. Transport inmates that are in custody at the Boulder County Jail to the Criminal Justice Center and Longmont Courthouse for court appearances on felony and misdemeanor charges. Provide courtroom security for those divisions with in-custody inmates. Provide courtroom security for jury and court trials on in-custody inmates. Documenting court proceedings and data entry into the jails computer management system. Transport inmates from the various mental health institutions throughout the state for court appearances on mental health hearings. Transport in-custody inmates to medical appointments. Pick up and return inmates housed in other correctional institutions on Writs of Habeas Corpus. Pick up inmates housed in other correctional institutions on Boulder County Warrants. Transport inmates sentenced to the Colorado Department of Corrections to Denver Reception Diagnostic Center. Transport inmates to and from various mental health institutions, including Centennial Peaks, Colorado Mental Health Institute Ft. Logan, and the Colorado Mental Health Institute Pueblo on new commitments and court appearances. Transport juvenile inmates to and from the various juvenile facilities throughout the state. Reduce the number of man-hours, fuel, and wear on vehicles. Coordinate with other agencies to move our inmates to a central hub. Assist other agencies by transporting their inmates to a central hub.